DESCRIPTION EXQUISITE, OUTSTANDING AND IMMACULATE in every detail! 5 bdrms, 5 baths. This amazing home features over 3800 sq.ft of luxurious lifestyle on 3 levels including WALK OUT BASEMENT on nearly 1/4 ACRE lot. Enter to a spacious grand foyer, with curved staircases leading up and down. Stunning ENGINEERED WIDE PLANK hardwood floors welcome you to a chef's dream kitchen, large LR area and oversized formal dining room. Kitchen features top line SS THERMADOR appl pkg with 5 burner gas stove, built in wall oven, warming drawer, dual sized fridge and wine fridge. Massive working island with QUARTZ WATERFALL countertop, dual stained cabinets and granite. 3 FIREPLACES IN HOME, AND one on garage for outdoor entertaining. Main floor boasts two great sized kids rooms (or a den/office). Upstairs we find a nice sized kids room, large 4 pc bath area and a massive Mbdrm with STUNNING ENSUITE, FIREPLACE, STEAM SHOWER AND HUGE WALK IN CLOSET (c/w laundry), private balcony overlooking rear yard. Lower level hosts a great exercise/flex space leading to the exterior. We also have a large additional family room space with 3 sided FP. And then we enter the MEDIA ROOM which is top shelf in every detail. Built in sound system throughout the home. Basement includes INFLOOR HEATING AND SECONDARY LAUNDRY ROOM. This entire home is SMART WIRED for irrigation, security, sound and lighting. GARAGE features exterior FP and enough room to park 3 vehicles albeit is is a large oversize 2 car. LANDSCAPING IS PHENOMONAL!!! Exterior finishes on the home with all the stone make this property a true masterpiece. A huge patio in rear yard compliments the entire landscape design and will make this area a fantastic place to gather, BBQ and host all of your friends. A TRUE VALUE and this home could not be rebuilt for the sale price! Home for sale at 3202 27 ST Sw Calgary, Alberts T3E 2G8. 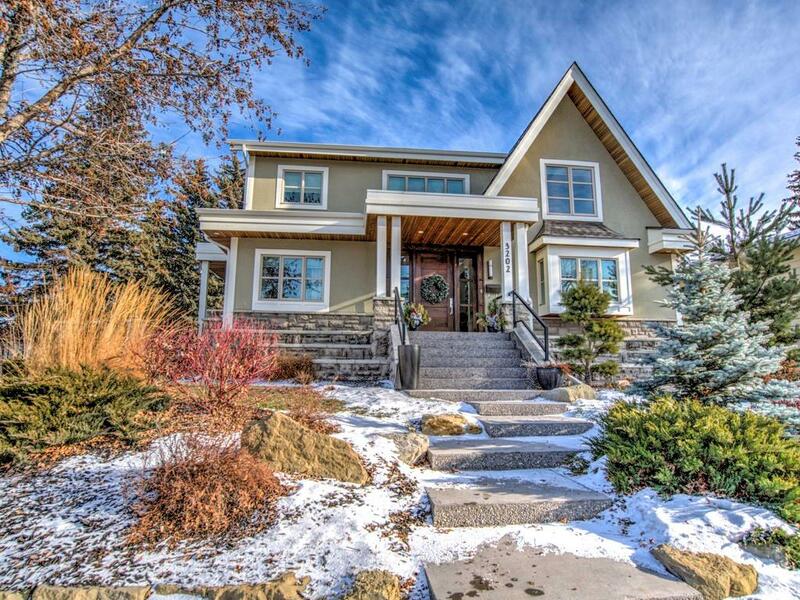 Description: The home at 3202 27 ST Sw Calgary, Alberta T3E 2G8 with the MLS® Number C4224570 is currently listed at $1,650,000.